Shelby County Democratic Chairman Tom Kerrigan, left, congratulates Mark Mabelitinim, who was chosen as the Democrat of the Year. Shelby County Democratic Chairman Tom Kerrigan, left, congratulates Virginia Thompson, who was selected as the Outstanding Shelby County Citizen. Sidney Municipal Court Judge Duane Goettemoeller talks about growing up in Shelby County during the Jefferson Jackson Dinner of the Shelby County Democratic Party Thursday night. BOTKINS – Hard-working traditional values were touted as a successful road from poverty for a local elected official who addressed the crowd at the annual Jefferson Jackson Dinner of the Shelby County Democratic Party in Botkins Thursday night. Also, Mark Mabelitinim of Sidney, was chosen as the Democrat of the Year with Virginia Thompson, of Botkins, selected as Outstanding Shelby County Citizen. More than 70 people attended the event held at The Palazzo. 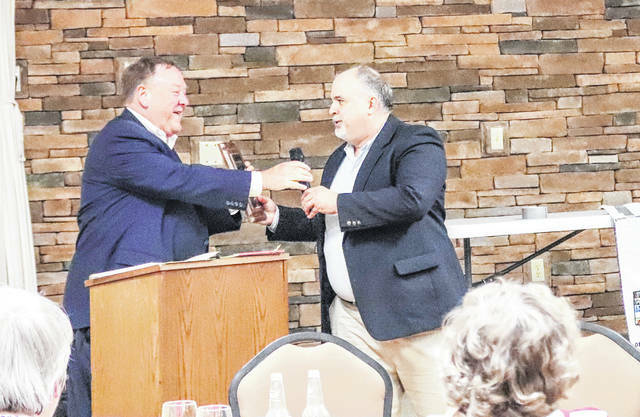 As keynote speaker, Sidney Municipal Court Judge Duane Goettemoeller spoke about his youth in Shelby County as the son of a rural-based family and blue collar workers. Strengthening the family values were always a main focus, he said. Goettemoeller is seeking re-election as the non-partisan judge in the May 7 election. He has been the presiding judge since 2011. The judge spoke of his father, Harold, a Korean War veteran, who worked for more than 30 years at Sidney Electric Co., while maintaining a grain and livestock farm. His mother, Dolores, worked as a welder at Stolle’s in Sidney before becoming a full-time homemaker and mother of six children. Later she became a teacher’s aide at Botkins Local School. Goettemoeller said his parents taught their children to persevere regardless of the circumstances. He spoke of the “grit” he and his siblings were taught to achieve higher goals such as education. “We were constantly driven to improve in everything we did,” he said. He likened such “grit” that helps take someone beyond effort and IQ. “Grit will always trump talent,” he remarked. Shelby County Democratic Party Chairman Tom Kerrigan of Sidney introduced both Mabelitini and Thompson in receiving their respective degrees. Kerrigan said Mabelitini was very active within the party during 2018. His main function was serving as treasurer of the party’s central committee. Regarding Thompson, he spoke of her long time service to the party on many fronts over the years. As owner of At Home Bistro, Mabelitini is a personal chef available to provide an in-home dining experience from two people to a larger gathering. He also works as a part-time school teacher in the Houston, Fort Loramie and Sidney City school districts. In volunteering to promote the party, he has created a free school supplies program for Shelby County schools late in the academic year, a veteran’s program called Drive for Vets, and operates a Democratic Party stand as part of the downtown Sidney farmer’s market. He is a native of Dayton and attended Capital University and Indiana University. He and his wife, Aliana, have four children. Thompson is retired serving as an educator for many years with Anna Local Schools. She and her husband, Jim, have three children. She has been a long time member and chairman of the central committee, president of the local chapter of the American Association of University Women, and is current president of the Shelby County Democratic Women. Kerrigan noted she is also active in Botkins community events and has served at many charitable events. https://www.sidneydailynews.com/wp-content/uploads/sites/47/2019/04/web1_DemofYear-copy.jpgShelby County Democratic Chairman Tom Kerrigan, left, congratulates Mark Mabelitinim, who was chosen as the Democrat of the Year. 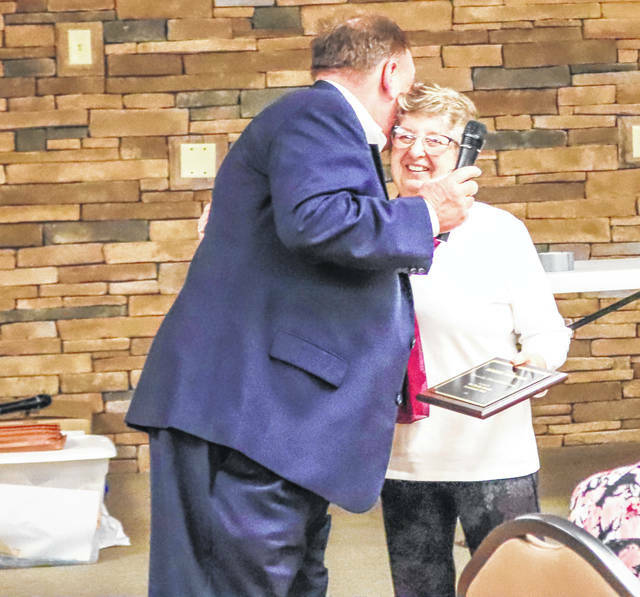 https://www.sidneydailynews.com/wp-content/uploads/sites/47/2019/04/web1_CitizenofYear-copy.jpgShelby County Democratic Chairman Tom Kerrigan, left, congratulates Virginia Thompson, who was selected as the Outstanding Shelby County Citizen. 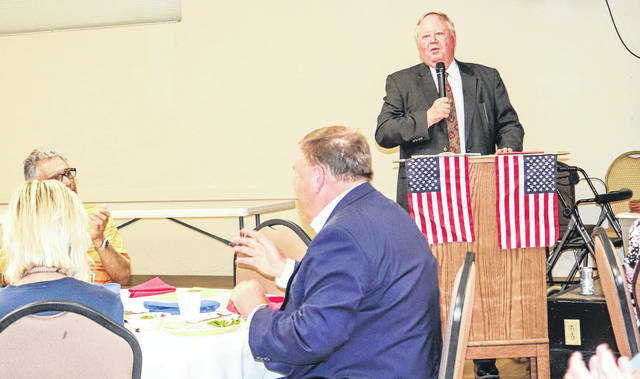 https://www.sidneydailynews.com/wp-content/uploads/sites/47/2019/04/web1_Judge-copy.jpgSidney Municipal Court Judge Duane Goettemoeller talks about growing up in Shelby County during the Jefferson Jackson Dinner of the Shelby County Democratic Party Thursday night.